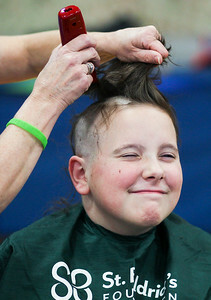 Sarah Nader- snader@shawmedia.com Sean Bolger, 11, of Richmond smiles while his hair is shaved into a mohawk while participating in the second annual St. Baldrick's event at Nippersink Middle School in Richmond Wednesday, February 25, 2015. Last year the school raised $20,000 in donations for the cause. 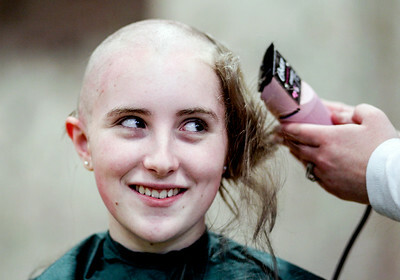 Sarah Nader- snader@shawmedia.com Megan Hellier, 14, of Richmond has her head shaved at the second annual St. Baldrick's event at Nippersink Middle School in Richmond Wednesday, February 25, 2015. Last year the school raised $20,000 in donations for the cause. 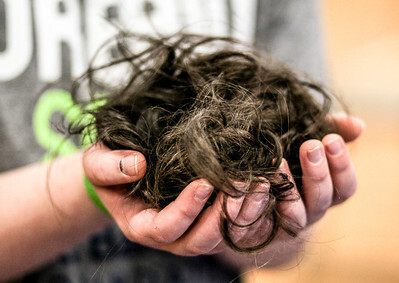 Sarah Nader- snader@shawmedia.com Sean Bolger, 11, of Richmond holds his hair after having his head shaved at the second annual St. Baldrick's event at Nippersink Middle School in Richmond Wednesday, February 25, 2015. Last year the school raised $20,000 in donations for the cause.